DENVER (KDVR) -- A church for marijuana enthusiasts is planning its official grand opening in Denver, just in time for the "high holiday" of April 20. The International Church of Cannabis has taken over a former Lutheran church at 400 S. Logan St. and claims to be the first large venue in the world where cannabis can be legally consumed in a social environment. Elevation Ministries says the church will "offer a home to adults everywhere who are looking to create the best version of themselves by way of the sacred plant." Members of the church call themselves Elevationists, founding member Steve Berke said. "Our lifestance is that an individual's spiritual journey, and search for meaning, is one of self-discovery that can be accelerated with ritual cannabis use," the website states. "Elevationists claim no divine authority, nor authoritarian structure, therefore, those of all religious and cultural background are welcome to visit our chapel and take part in our celebrations." According to the group's IndieGoGo page, it is trying to raise $100,000 to repair and upgrade the 100-year-old church to make it accessible to those with disabilities, such as wounded warriors. Organizers plan to offer documentary screenings, guest speakers and musical performances at the church. 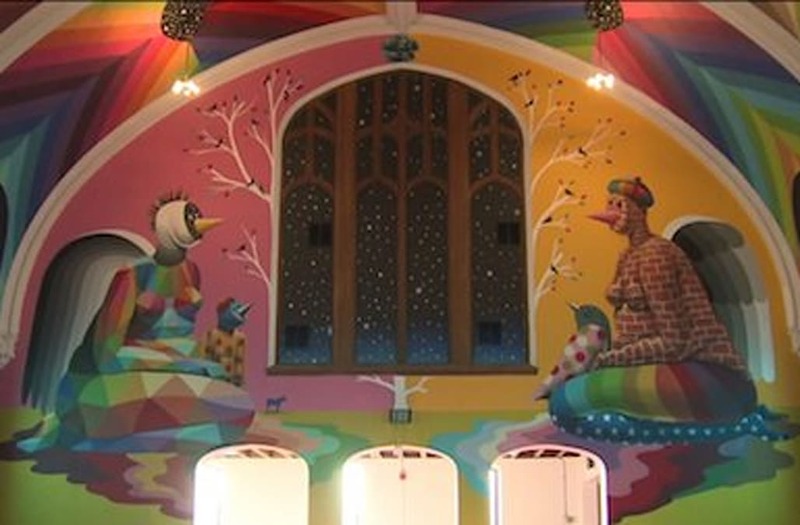 A 360-degree photo shows the chapel ceiling and walls featuring colorful imagery painted by artist Okuda San Miguel. Cannabis consumption at the church might raise some legal issues. Colorado law doesn't ban or permit marijuana clubs, but many opened as tourists said they needed somewhere to legally smoke. Lawmakers are still considering a bill that would let local governments decide whether to allow social pot clubs. The bill would also allow any jurisdiction to ban them altogether.